The teaser trailer for Star Wars Episode IX was released at the Star Wars Celebration in Chicago this weekend, as was the name, Star Wars: The Rise Of Skywalker. 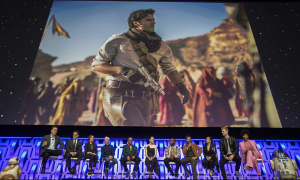 Check out these soundbites below with some of the cast, plus director JJ Abrams and producer Kathleen Kennedy. I’ll warn you now, some of them are VERY short, though 30 seconds of Oscar Isaac is quite enough before I have to go and have a lie down. Anyway you get nearly a minute with Rey! (I know, I spoil you lot.) And one minute, 6 seconds of JJ Abrams – he’s obviously a talker.